This stallion had kicked and caught his leg on the top wire of a fence. 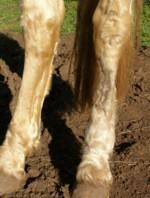 This removed the skin on the inside of his rear hock to the pastern joint and the shin bone. He had severed a few arteries and was bleeding badly. The vet was called straight away. While waiting for the vet, we replaced the skin flap and strapped it with a pressure bandage to stop the bleeding. He was also given homeopathic Arnica 30C every five minutes until the vet arrived. The vet removed the skin flap and re-bandaged the wound, remarking that it was the worst leg injury he had seen in his many years in veterinary care. For two weeks, the leg wound was washed daily with Ionic Silver, and Manuka honey and Calendula cream were applied to it. The leg was then re-bandaged. Homeopathic Arnica 6C was given once a day to help with inflammation and bruising, and to prevent blood clots. A dose of Homeopathic Ledum 30c was given to prevent tetanus. The stallion was fed one tablespoon of Vitamin C powder per day to also prevent tetanus and promote healing. Chamomile flowers and rosehip granules were added to his feed. When the wound had healed, Comfrey Cream was applied to the dry wound. Please note: Comfrey should never be used on an open wound.